Pick the Business & IT pathway if you want to spend a whole day immersed in these two complimentary subjects, with the chance to apply your learning to the wider world of work. Our primary professional partners on this pathway will be local businesses, such as in IT where we’ll work with companies who will act as our ‘clients’ on practical projects to create apps and websites. 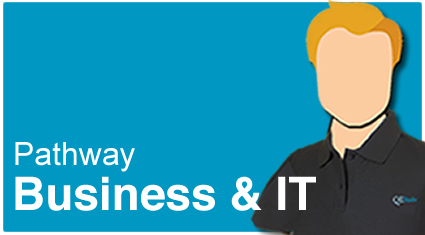 Business & IT is a Level 3 Pathway and you would study this specialism on one whole day each week, as well as in additional theory lessons and would undertake both the Business Studies A level and the IT Technical Award. For local links in this Pathway, we’ll be building on our network to give students insight into how professionals run their operations on a day-to-day basis, rather than a purely traditional focus on ‘textbook’ learning. Plus points for Business & IT include the fact that this specialism would be taught in our new accommodation which has seminar meeting rooms, specialist IT and a range of workplace environments within which you can apply your Business and ICT learning. In terms of future directions, this pathway course gives you a double boost – you get points for your UCAS application, plus essential skills that will help whether you go to University or straight into the workplace.